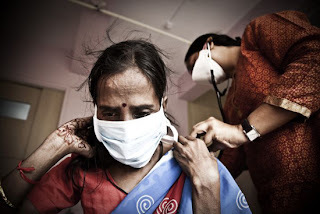 The Bigger problem- India is the highest TB burden country with World health Organisation (WHO) statistics for 2010 giving an estimated incidence figure of 2.3 million cases of TB for India out of a global incidence of 9.4 million cases. The WHO statistics also show that India is 17th out of the 22 high burden countries in terms of TB incidence rate. The estimated TB prevalence figure for 2010 is given as 3.1 million. It is estimated that about 40% of the Indian population is infected with TB bacteria, the vast majority of whom have latent rather than active TB. Compliance issues in Treatment- To treat TB, the WHO recommends the so-called DOTS (Directly Observed Treatment Short-course) strategy, where patients take medication under supervision from health staff. Daily supervision of treatment is too demanding for most of our patients and instead implements self-administered therapy with patient education and support to ensure adherence. In many countries affected by conflict, access to health structures is limited for the population. Conflict interrupts travel and makes people fearful of leaving their shelters to seek assistance. It can also lead to the collapse of existing health systems.In India in 2010 292,972 people needed TB re-treatment because of initial treatment relapse, failure or default. Operation ASHA is a registered non-profit that has taken TB treatment to the doorsteps of 5.37 million individuals living in disadvantaged areas. It operates in over 2,053 villages and slums in six states spread across India and Cambodia. The effort is self-sustainable and is using technology to reach out to millions everyday. Establishing Centres- Operation ASHA establishes tuberculosis (TB) treatment centers within existing community locals (for example, strategically placed shops, homes, temples, or health clinics). 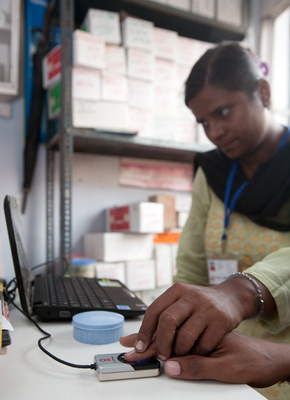 Under the World Health Organization’s Directly Observed Therapy (DOTS), patients must take their medicines under the supervision of a health care worker. The model is designed to help patients procure their medicines conveniently without wasting time, spending money on transport, and losing wages. This also drastically reduces the effort, time and money that patients have to invest in taking their medication, which is key to ensuring that patients complete the entire course of treatment. Training- Operation ASHA trains community members (often former patients) to become tuberculosis health workers who are responsible for identifying new patients, ensuring adherence to the drug regimen, and carrying out regular educational campaigns. Operation ASHA works closely with the Government of India, who provides them with free medicines and diagnostic services. After a center has been established for two years, the government provides a grant for every patient cured, making OpASHA’s centers financially self-sustaining. 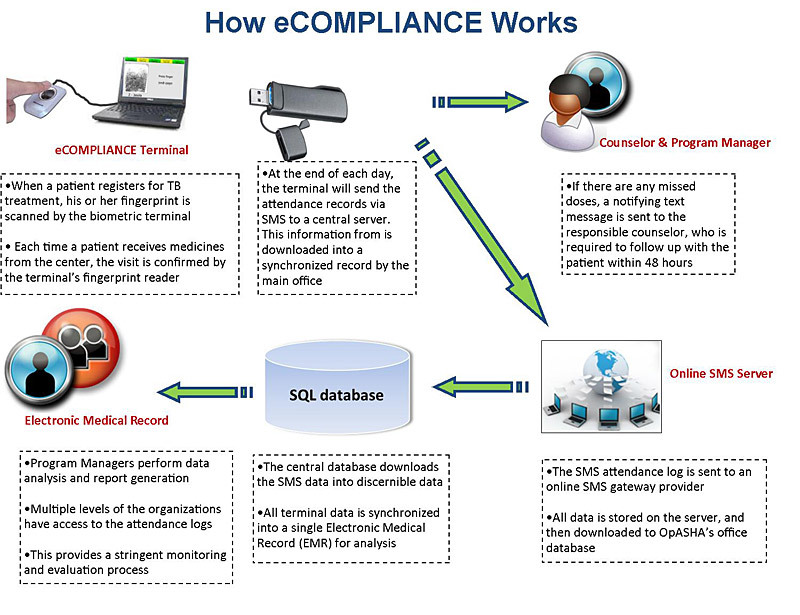 Building Compliance through technology- Ensuring patient compliance is important because of the threat of multi-drug resistant tuberculosis (MDR-TB), which has become one of the world’s largest public health issues. Resistant strains of the disease can take up to two years to treat (in comparison to the standard 6 month regimen). Second line medicines have more severe side effects and can also cost 50-200 times more. Such unrealistically high costs are essentially a death warrant to those below the poverty line. 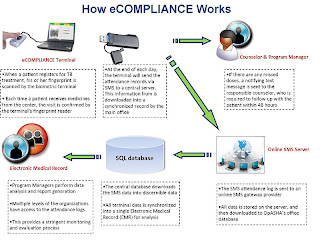 To combat the rising MDR-TB epidemic, OpASHA launched eCompliance, a biometric initiative in collaboration with Microsoft Research, which uses fingerprint scanners to track patient visits. and a GSM modem that uploads the visitation logs (via SMS) to a central location. Patients scan their finger every time they take medication, and these logs are visualized in the central office to monitor medication delivery. Missed doses trigger an SMS notification to managers, who ensure timely supervision or counseling to the patients and health workers involved. The health worker is then required to do a follow-up visit within 48 hours to deliver the medicines and supplementary health education. These home visits are also confirmed by biometrics. Currently the terminal is used daily in over 40 treatment centers, spanning Delhi, Mumbai, and Jaitpur; Operation ASHA is aggressively expanding the deployment to over 225 centers around the world. To date, the technology has enrolled about 2,700 patients and logged over 50,000 supervised doses. The biometric records are used to automatically generate reports to the government and other stakeholders. With the help of eCompliance, Operation ASHA has reduced its default to 1.5%, which is much lower than other institutions. The cost of treating a patient for the entire therapy of is US $50.